In taking a deep dive into the world of the extraordinary and turbulent artistic partnership of Brett and Wendy Whiteley, theatre maker Kim Carpenter had to confront some of his conflicted feelings about his own art. In the end, Carpenter chose NIDA over art school, “because it was a shorter course! I didn’t like the idea of being in an institution. Carpenter is the founder of the Sydney-based Theatre of Image, Australia’s pre-eminent maker of image-based stage work for the past three decades. Brett and Wendy … A Love Story Bound By Art, which premieres at Riverside Theatres during Sydney Festival 2019, is one of the company’s most ambitious productions to date, blending dramatic scenes, dance, movement, digital projection and a live soundtrack. Brett & Wendy traces the life of an artist and his muse from childhood on Sydney’s lower north shore, their adventures in London in the 1960s, the couple’s pivotal move to New York City in the 1970s and their return to Sydney, where Whiteley would create his iconic images of Sydney Harbour. 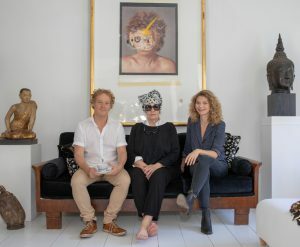 The story is derived from deep research into Whiteley’s life, conversations with Wendy in her Lavender Bay home, and meetings with friends and family. Brett and Wendy’s story is a one of peaks and valleys, says Carpenter. on (Brett) and Leeanna Walsman (Wendy). Tony Llewellyn-Jones plays Lloyd Rees, the Australian landscape artist Whiteley, and many others of that generation, revered. And while the image is paramount, music is a crucial part of the experience, Carpenter adds. Kennard’s score for Brett & Wendy owes something to the Oscar-winning soundtrack to the 2014 film Birdman, starring Michael Keaton. 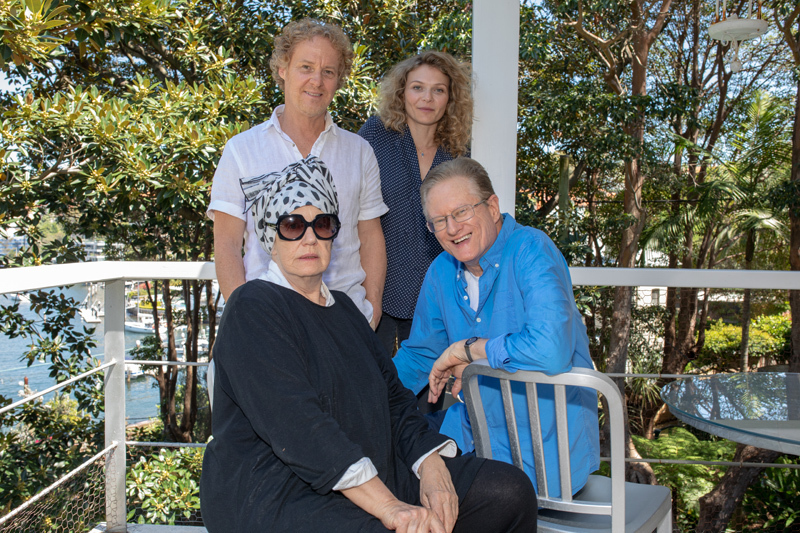 Featured image: Wendy Whiteley, Kim Carpenter (Creator, Director, Designer), Paul Gleeson (playing Brett Whiteley) and Leeanna Walsman (Playing Wendy Whiteley) at Wendy’s house in Lavender Bay.